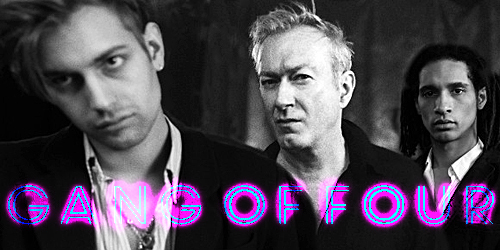 English post-punk group Gang of Four has announced a new EP, titled Complicit, to be released on April 20, with plans to release a full-length studio album in summer. This marks the first new material from the band since 2015’s What Happens Next, with the EP addressing themes of sociopolitical turmoil and as a means for producer and founding member Andy Gill to advance his writing partnership with front man Gaoler. The leadoff single “Lucky,” which was released in March, is presented in an original version and 10 O’Clock Chemical remix; co-produced with Ben Hillier (Depeche Mode, Blur), the track is described by Gill as “a product of chance. I’d been watching a serious debate on one of those financial news channels – six white men in suits arguing about the stock markets – and it set me thinking about how limited luck can be.” As such, the song critiques the significance placed on the element of chance, though “luck isn’t capable of fundamentally changing the system.” The tracks “Ivanka (Things You Can’t Have)” and “I’m a Liar,” the latter of which was co-produced by Ross Orton (Arctic Monkeys, M.I.A. ), go further to not only address the “poisonous invective of the White House,” but also issues of misinformation, the growing difficulties in differentiating truth from un-truth, and denial of the truth due to distrust of facts.